The Behringer HB01 Hell Babe Wah Pedal is a multi-functional Wah-Wah pedal offering everything you need for virtually all styles and sounds. 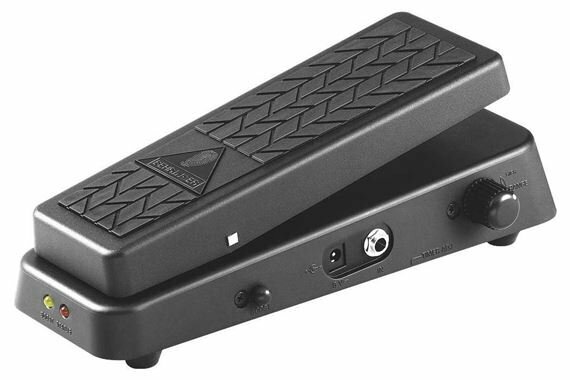 The Behringer HB01 Hell Babe Wah Pedal is the Ultimate Wah-Wah Pedal with Optical Control. This multi-functional Wah-Wah pedal offers everything you need for virtually all styles and sounds. Different from most pedals the Hellbabe uses complete optical control for wear-and-tear-free pedal operation (no mechanical pots and switches) plus it features a unique spring-back pedal mechanism with resistance adjustment for the ultimate freedom in playing styles. The heel-down frequency range is freely adjustable using Range control (440 Hz to 250 Hz), so you can use it even with bass guitars. An additional Fine Tune control allows high-end extension of sweep range for achieving incredibly bright, ultra-present tone. The musical Q control is provided for precise filter shaping and achieving vocal-like effects. The tunable boost function includes an On/Off switch that lets you push your licks up to the limit. Behrigner has included dual LED indicators for Effect On/Off and Boost On/Off at the tail of the pedal. Only ultra-low noise circuitry is used throughout for outstanding audio performance. Run your HB01 on a 9V battery or a DC power supply (not included). but not a total loss,A good value and seems to be a quality product. To much crap on this pedal. Great for clean tone stuff but not doing what I need for heavier dark stuff. But it's a cheaper Wah then most with all kinds of tweaks to it. Maybe threw time I'll dial it in better. Wah,wah for not a lot of Moolah..
Works well good little wah,wah for the money, does not come with power adapter,but you can use a 9 volt as well. This Wah is affordable , looks great , and sounds clean both with guitar and bass. I've spent hours tweaking the settings on the HellBabe, and still no "quack". I'ts no "crybaby". Whaaa! That said, it does have some nice features though, and am able to produce some really interesting & unique tones with it. It's really well built, with a "tank-like" plastic frame & decent switches. Bottom line, for the price, I'm going to keep it for what it does, and not return it for what it doesn't. As usual AMS' service & shipping was stellar, for which I added a star over and above the product rating. I have several other Behringer products I'm happy with, and won't hesitate to buy the brand again. You might buy the HellBabe to try, & it may add something to your sound you like. I play a custom-built (by me) Strat-type H-S-H guitar, tube amp, and a plethora of pedals. Retired professional. Well worth the money .. The wah-wah was not what I expected. Not as good as a "cry baby". I had to return it. The return process was quick and easy. A dream to practice with and while micing a cab. The amount of mods and adjustments available to you are well worth exploring and experimenting with. Well done. Fresh out FedEx truck. What a great pedal,just what I was looking for. You can control eq,boost and the range of the growl plus you can set to keep the wah active after your stop rocking the pedal. For this price range has so many features equal to more expensive brands. Great casing,good sounds and features plus the best and faster shipping in the business. Thanks to American musical supply I have the best shopping experience. Is my second purchase and I'm really happy. And for the pedal,at his price try it. I like it. Great Cry Babe sound for the price.